One day last year I was having a particularly difficult time. It was my best friend Shauna’s two year anniversary and for the first time ever, I didn’t want to be in DCU. 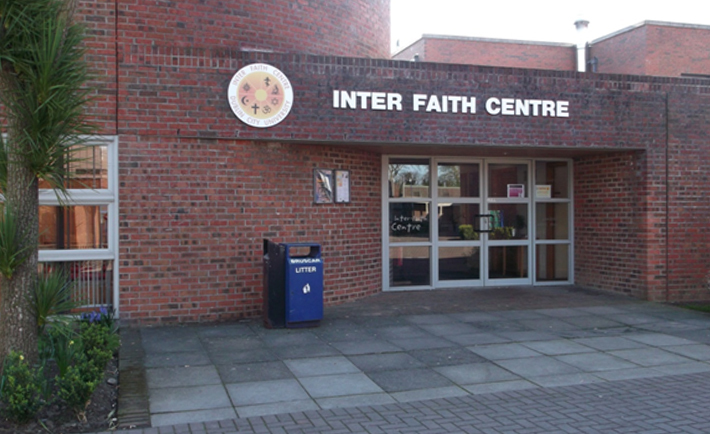 I went into the Inter Faith centre, mainly just to reduce the risk of anyone I know seeing me in tears. I sat in the corner of the Inter Faith centre wanting nothing more than to be by Shauna’s grave back at home. I saw the doors of the ‘Quiet Room’ and decided it was worth looking in to see if it was empty. Although it was not empty, there was an immediate sense of relief and a calmness. As soon as I went in I knew it was okay to get upset, and so I did. The only other person in the room was an older man who looked completely empathetic to my pain. Just as he went to leave he came over put his hand on my shoulder and said, ‘I said a prayer for you’. This is when I met Susan Jones, Chaplain to the Inter Faith Centre. She came into the quiet room after the man who prayed for me asked her to check in, and she brought candles for me to light. Although I still felt as though my heart was breaking and was still incredibly home sick, it was the closest thing to comfort I could ask for at the time. I found peace in a place I thought only the most religious worshippers were welcome. I spoke to Susan last week, in an effort to abolish the common misconception about who and what is welcome in the Inter Faith Centre in DCU. “Students of all faiths, tradition and none can come in to the centre. That’s why there is a blank section on our logo, to show that we recognise there are people who don’t believe in anything, and that’s fine,” Susan explains. From my experience of the Inter Faith centre, I became less and less conscious that my lack of religious beliefs were an issue, so what happens when atheist’s or non-believers seek help within the Inter Faith? Often however, people just need a calmness and a break from their busy lives, that is where The Quiet Room comes in useful, what is in my opinion, DCU’s best kept secret. Because the chaplains themselves are Catholic, I myself questioned how they can remain impartial, non-judgemental and welcoming to all beliefs or lack thereof. There seems to be a mutual level of respect in the Inter Faith, where no one person, religion or member or the inter faith is superior. There are three main aims in the Inter Faith Centre, building community, learning about cultures and religion and mindfulness. From calling in for a free cup of tea, to lighting a candle and taking a break, to praying to the God(s) you believe in, the Inter Faith seems to vary for each person. The main point to remember, is that it is welcome to all, regardless of beliefs, feelings, or thoughts.